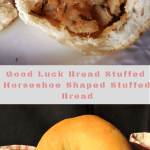 We loved this Good Luck Bread- Lucky Horseshoe Shaped Stuffed Bread! New Year is the time when you look for a lot of good luck and fortune. 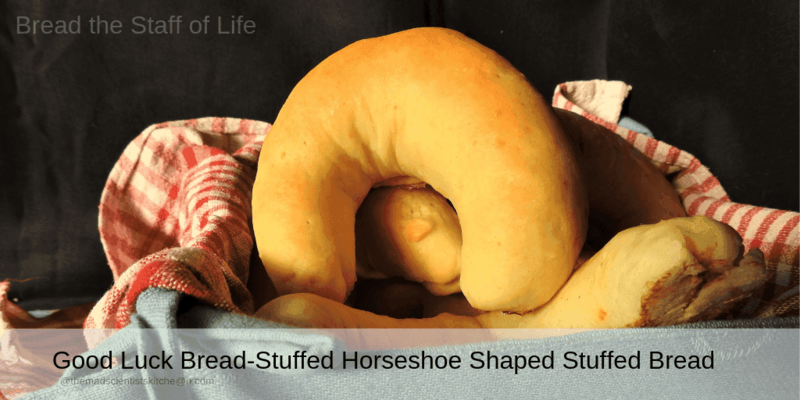 What better way to celebrate the New Year but with a horseshoe-shaped bread? Horseshoes are considered as one of the many lucky charms. There are many legends associated with this one of them says that mischievous fairies cannot stand iron, another is associated with that Saint Dunstan tricked the Devil to promise that he will stay away from houses with a horseshoe on the door. Thus, any house with a horseshoe was guaranteed to be lucky. When I saw her choice of Goodluck bread I was surprised for I had never heard of them. I thought since I never have the time and the artistic inclination to shape etc. I will give it a miss. But then curious cat that I am I had to see just what these bread where and I choose the simplest of the shapes. LOL! Thanks a lot, Felice because of you I am like yes I can do this. Will try something better next time. Actually, the bread can be shaped from any bread dough but I followed this recipe only halved the recipe. I have stopped stocking on eggs and hence I had no eggs to add to the dough. The water I had to hence increase by about ½ cup so check accordingly. I used milk to knead my dough, only in the end when the dough was dry I used warm water about a tablespoon at a time. Also at the last possible moment because I had this dry vegetable made from potato too dry to eat with chapatti, our staple food I stuffed it in the bread. Now, this bread I have shaped not used a ready pan. In a bowl add the maida, salt and sugar, yeast and stir the mixture. Add the milk and water and egg if using to the dough and mix well. until the dough comes together. Tip the dough on the countertop and with the heel of your hand mix the butter in. At this point since my dough did not have the egg, I started adding the water 1 tablespoon at a time till the dough is soft, spring and you get a windowpane when you stretch the dough. Make a ball out of the dough. Lightly grease the bowl and place the dough in it. Turn over so that the bottom is also greased. Cover and let it rise, for 45 minutes or till double. When the dough is ready gently degas the dough and cut it with the dough scraper in 8 wedges. Lightly flour the work surface and take one ball roll out the dough in rectangular /oval shape. To the edge place a stuffing vegetable on the longer edge (about 2 tbsp per roll) then gently roll the dough to a tube. Pinch and Seal the edges then gently shape the tube in a horseshoe shape. Transfer to a greased baking tray and let it rise for 30 minutes. Towards the end of the 30 minutes preheat you over at 190° C /375° F.
Brush the rolls with the milk and bake for 25-35 minutes till the rolls are golden brown on top and sound hollow when knocked. Remove from oven brush some butter and let rest for 10 minutes and then plate and serve. In case you do not use eggs you will need to add water. Use only 1 tbsp at a time and please warm it before you start. 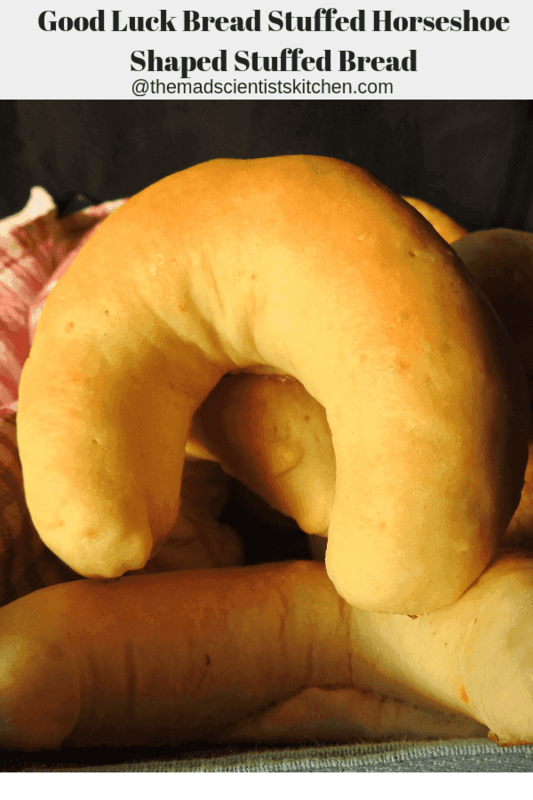 You can also give the rolls an egg wash.
A simple Good Luck Bread in the form of a horseshoe. Brush the rolls with the milk and bake for 25-30 minutes till the rolls are golden brown on top and sound hollow when knocked. 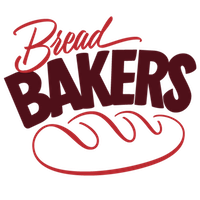 This month, the Bread Bakers are making Good Luck Breads, a theme chosen by Felice from All That’s Left Are The Crumbs. 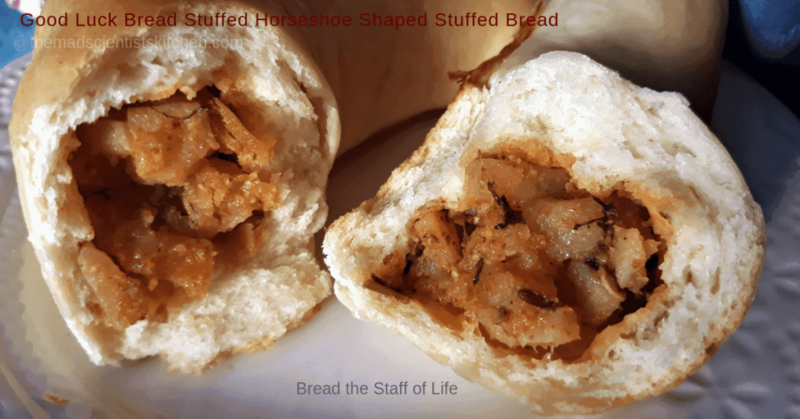 Lovely horse shoe bread there. and the idea of stuffing it makes it more nice. Well even with all your trials and tribulations, I think they turned out lovely. You shaped this so perfectly! I love the golden color too.